“Good morning,” said Benedict Cumberbatch as our paths crossed deep in the depths of the Barbican….. No, not a dream or an illusion but a real life celeb sighting. However, going into that now would mean that “The time is out of joint” so you’ll have to read on for more of that encounter – such a tease! It has been an extremely busy week on the A Play For The Nation project so first let’s go back three days previously – to the evening of Wednesday 14th October. Then each team was addressed in turn to receive specific feedback on their text task videos. As well as this Erica warned us that she would be asking for a couple of speeches per team to be performed live for the benefit of all. However, there was to be no prior warning about who might be called upon – I repeat, there was to be no prior warning! It became evident about halfway through the session that everything was in danger of overrunning so the specific feedback was considerably shortened (the plan being that instead Erica would give us this at our first face to face group session in London). As Tower were the last group alphabetically we had rather a long and somewhat nervous wait before it was our turn but very much enjoyed seeing the standard of text delivery from our colleagues around the country. Extracts from plays as diverse as King Lear, The Taming of the Shrew, Hamlet and The Winter’s Tale kept us moved and amused. When Erica finally turned to us she commented that we seemed to be sitting in a cupboard (I know the office is small but ….) paid us a few preliminary compliments and then called upon Peta and Tom to perform their duologue from Othello. Their many years of experience showed as they delivered the text with an ease and confidence of which we could all be proud. So, just one more speech to go. At this stage I felt somewhat safe from the fickle finger of fate – surely Al would be called upon to give his piece from Measure For Measure. After all nobody had done this one yet, whereas my speech had already been covered by Anthony from Blackpool….. alas I shouldn’t have been so presumptuous. An inane grin masks the panic! “Finally, “ announced Erica, “we’re going to ask John to give us his speech from Julius Caesar.” Well, I don’t know if you’ve seen Hitchcock’s Vertigo but I felt very much like the James Stewart character (see trailer) – an incredible sinking feeling with hints of nausea and a soupçon of panic. Most am drammers get at least a little bit of stage fright but this was something else. A photo taken at the time shows I am smiling but I think it must have been a rictus grin while I considered faking a heart attack or announcing that the room was on fire. Anyway there was nothing for it but to plunge in and after all it was only a couple of minutes. As the lines started flowing the tension eased and “the moment” passed. Erica had given me a note but I hadn’t really heard it above the thumping noise that was my heart at that point. It was only by asking the others afterwards that I found out that it was about being more steely and lethal in the last couplet – if that DID happen it was by sheer accident. Suddenly it was all over (and Breathe!) and Erica was introducing the second task. She reminded us that at the end of The Dream the Mechanicals perform a bergomask dance for the Duke and so announced that this would be a group task which would involve movement (cue second round of James Stewart Vertigo effect!). We were going to be sent five edited music tracks and were to come up with a two minute routine to our chosen piece and, as before, capture it on video. There was to be no external choreographer used – indeed it was to look as though Bottom had arranged everything – and at least one minute would need to be in synchronised unison. We had until the end of the month to rehearse, perfect and film. Now all well and good but with some group holiday and work commitments coming up we knew we actually had less than a week to get this ready. So as soon as the live link up was over, we set about choosing a track to work to. The following choices were on offer: Happy (Pharrell Williams), Relight My Fire (Take That), Uptown Funk (Bruno Mars), Reach Out (Four Tops) and Sing, Sing, Sing (Benny Godman). As I had no personal preference I was content to let the others hammer it out and eventually the decision went to Happy (a tune that within a very short space of time became a regular ear worm). For the next two nights we met to work out and perfect (I use the word loosely) our routine. This was quite draining work but increasingly satisfying as everything came together. 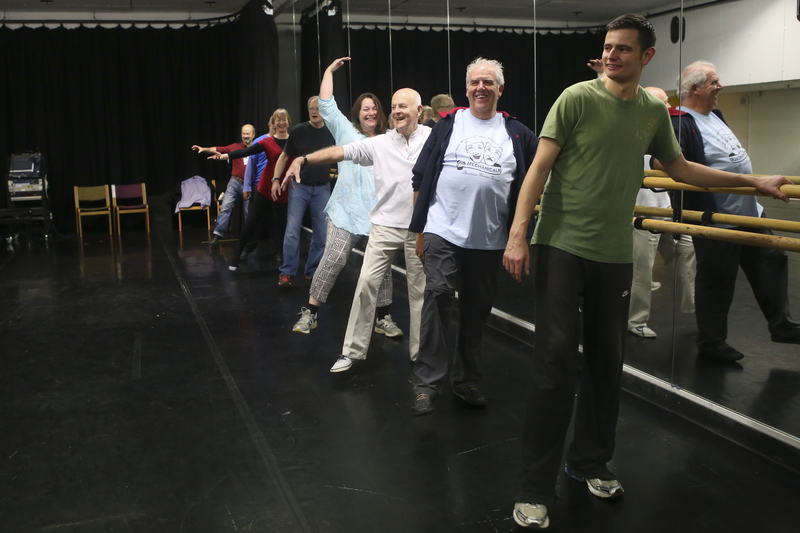 I have to say it was quite odd stomping (me)/dancing (others) around the rehearsal rooms – the first at a doctor’s surgery in Hanwell and the second in the ex-Guardian building in Farringdon (now renamed Theatre Delicatessen). The Friday evening was especially strange – not sure I’ve spent a birthday in quite such odd circumstances; the cake and fizz at half time also probably undid any physical benefits which had accrued. The following morning (Saturday) it was up early and off to the Barbican for a movement workshop with the RSC’s Sinead O’Keefe. Loosened up by the previous two evenings of hoofing around, this seemed generally less fearsome though there was another routine to learn (this time to Sam and Dave’s Hold On) which threatened to drive the first one out of my brain. We also learned about using our bodies to convey a sense of space, the different powers of the line and the curve and the ways a story can be conveyed simply through movement alone. 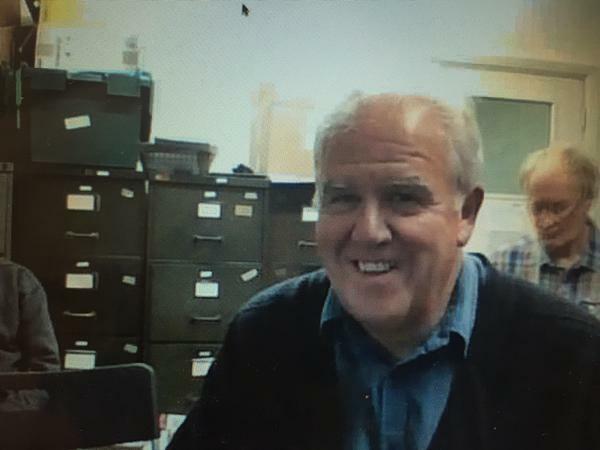 Sinead was a patient and very approachable teacher who ensured we always felt comfortable about what we were doing – after a time it was even possible to forget our friendly BBC cameraman Andy Richards who was once again recording our work for posterity. To see us striking a variety of poses please click here for a delightful series of photos taken by Ruth Anthony. Once again the three hours flew by but before we left we had one more thing to complete – filming our routine for the set task. 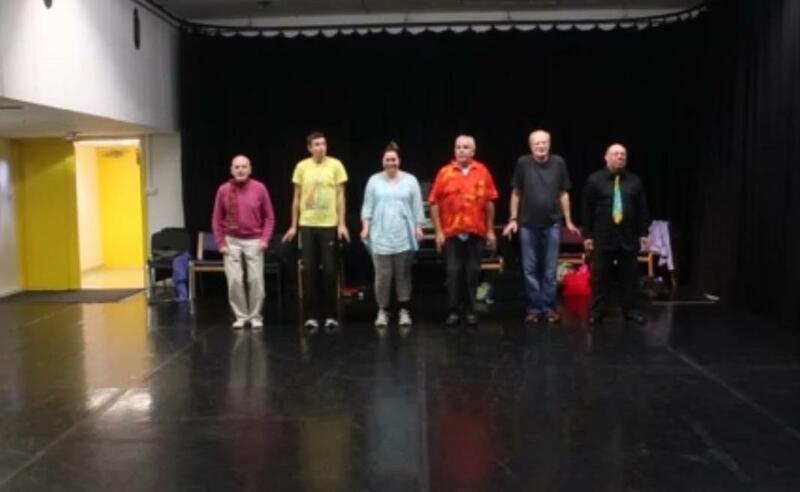 As we were in the rehearsal room at the Barbican we had plenty of space so it was an opportunity not to be missed and off we went – more accurately off we went for several takes. In the end it wasn’t perfect but then I don’t suppose Bottom and co. would have been either. Given the short space of time we had at our disposal, it was a fairly ambitious routine and I was pleased to come out the other side with no major errors or pulled muscles. And that was it – task set on Wednesday night, done and dusted by Saturday morning; it’s now going to be a very long wait before feedback (mid-November to be precise). Oh, I nearly forgot…. Benedict Cumberbatch. Well, what actually happened was just before our filming we had to vacate the rehearsal room for ten minutes as the production of Hamlet, currently playing at the Barbican, needed to get in there to run through the climactic sword fight. As we came through the rehearsal room door there were several people waiting to get in, among them a very familiar Sherlockian face. To be honest it was only after we’d all nodded politely to each other and said “Good morning” that the penny dropped. “That was….that was…wasn’t it?” And that was it – end of encounter. Nobody had a camera or phone at the ready and so there’s not even a picture for posterity. Sorry if that was all a bit anti-climactic but it did keep you reading on, didn’t it? …. Didn’t it? Having carried out research on Bottom as a working man and as an Elizabethan theatregoer I thought it was time to turn my attention to Bottom the amateur actor. To that end (and purely for research purposes, of course! ), I thought I should get myself involved with another slice of theatre pie. Though I may have worked my way through some 140+ productions over more years than I care to remember it’s one of those things in life where you’re only as accomplished as the next thing you’re doing. 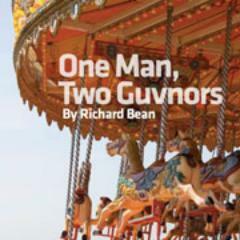 And the next thing I’m doing starts tonight at the Gatehouse Theatre in Highgate; none other than that international smash One Man Two Guvnors. As I’m sure you’ll be aware OMTG was a runaway success in both London and on Broadway and catapulted James Corden even further into the stratosphere. I saw it twice in London and rate it as the second funniest thing I’ve ever seen (sorry, but Noises Off still has it by a nose – but been there, done that ). 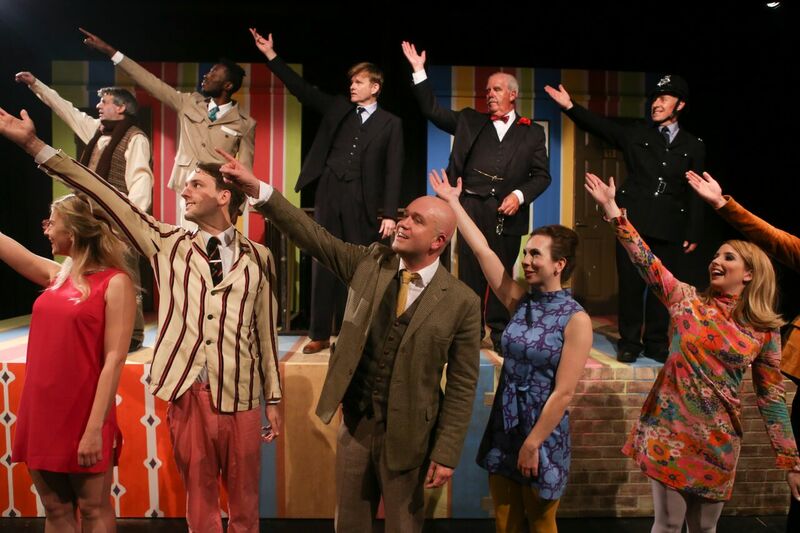 Tower Theatre are now putting on one of the earliest amateur productions of this riotous comedy in the country (i.e. in the UK – not in a field somewhere!). Based on the 18th century Venetian playwright Goldoni’s A Servant Of Two Masters, OMTG tells the story of Francis Henshall and his interaction with some of the less savoury elements of London and Brighton in the early 1960s. Using the structure of commedia dell’arte, it’s a fast and furious farce with some exquisite set pieces, plenty of verbal and visual humour and some very memorable characters …and if you like early 60s pop music and some eye catching design then you’re in for an extra treat. Announcements about the RSC Dream project had only just been made when Tower’s autumn season of six productions was announced (they put on 18 shows a year). Although I knew that being cast as Bottom was a dream beyond expectations, I also knew I wanted to keep myself involved in some other capacity with the company that had put me forward for this massive opportunity. When I saw One Man Two Guvnors on the list I knew this was my preferred choice. The necessary commitments to the Dream project were still unclear at this point so I was wary of trying to overextend myself. However, as I knew I wanted to take on a directing role with the company at some stage this seemed like a perfect opportunity to offer my services as Assistant Director (a requirement to take on that role before being allowed to fly solo is a company rule). Fortunately the director Dan and I had worked together on a production of Joe Orton’s Loot a couple of years ago so we already had form. The audition process was undertaken in late August and drew a competitive field; it’s definitely the sort of play people want to be in. As one of the roles was left unfilled I found myself taking on that mantle too. Great – best of both worlds, really; the possibility of contributing to the overall look and, hopefully, success of a production and then getting to put in an appearance in the finished article. 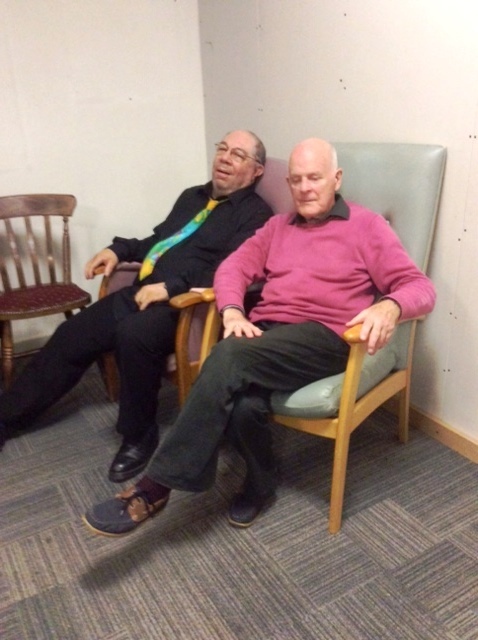 The cast contains a mixture of people I’ve worked with before – great to renew their acquaintance, am working with currently – Adam (Flute in the Dream project ) and I are playing son and father and new colleagues – always good to stimulate the acting muscles by working with fresh blood. The demanding central role is going to be a real tour de force for Mark (our Francis) but every character is really well drawn and fully realised; these guys are seriously good and inspire you to aim for your best. Yes of course there have been the inevitable stresses and strains attendant on putting together a show where its reputation precedes it, but I can genuinely say the experience has been a happy one. Rehearsals have been huge fun and even six weeks later there are parts that still crack us all up. Yesterday was technical/dress rehearsal day. Those readers involved with amateur dramatics will know how stressful that generally is – and can probably appreciate why this week’s blog post is perhaps a little less polished. The day started at 11.00 am and finished exactly twelve hours later with us getting directors’ notes huddled in a corner of the downstairs pub (now, there’s an inducement) by which time all the diverse elements had come together to create a unified whole. The only missing component is the live audience – the part that gives theatre work its totally unique character -and the first lot will be through the door tonight. Ticket sales have been very good (and that’s not just advertising spin) so if you are planning to come along – and I hope you are – please click on the relevant links towards the bottom of this post to ensure a place. Now, I know by now you’re probably thinking… “Hang on just a minute there! I come here to find out about A Midsummer Night’s Dream not another production altogether. This blog post is just a cheap advertising gimmick to sell tickets for something else.” Well, OK – slightly guilty as charged but just let me get this out of my system and then normal service will be resumed. Anyway, believe it or not there is actually a link between One Man Two Governors and the RSC Play For The Nation project. The author of the former (Richard Bean) and the director of the latter (Erica Whyman) are real life partners. Small world, isn’t it? Hope to see you in Highgate!